Is Microsoft About to Reveal their Kindle Fire Killer? A few days ago word went out that Microsoft is holding a June 18th gathering that will involve a major announcement of some sort. Shortly after that there was a leak of inside information that indicates this will be Microsoft’s first computer hardware offering. As early as tomorrow we may have some details about an upcoming Windows 8 tablet developed and manufactured by Microsoft itself. The big question now is what market they are shooting for. It might make sense for this to be a big push against the Kindle Fire. Consider the situation that Microsoft has gotten itself into. They are trying to take over the tablet market from Apple while still maintaining dominance in the PC market. They are doing this by supporting everything in an attempt to create consistent experience. Tablets, PCs, video game consoles, phones, everything will have Metro on it sooner of later. Unfortunately this includes supporting multiple architectures, which has made the company split their project. Windows RT is what they are calling the branch of Windows 8 that runs on ARM devices and it might be in trouble. While Microsoft is trying to create consistency, none of the applications that run on Windows RT will run on the rest of Windows 8, nor will the reverse be possible. This means that they can’t necessarily count on the hordes of existing Windows software developers to jump on board. The reason this matters to Kindle Fire fans is mostly that this would be a great time for Microsoft to demonstrate how a well designed product running their software can perform. They’re already going to be pulling in a lot of people with touch interface experience for their app store. The segment that is willing to concentrate specifically on tablet customers to the exclusion of desktops will likely be Android and iOS developers. As a result we might see something that can do everything the Kindle Fire can, with a similar integration into a large existing media ecosystem, running an admittedly better tuned OS. Amazon might end up with problems. Pretty much only one thing makes this somewhat questionable. 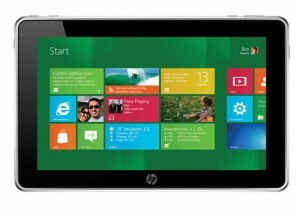 Microsoft has not shown any particular interest in going into the budget tablet market. They actually seem to want to disregard Android devices entirely and head straight for the top to knock down the iPad. Reports indicate that OEMs working on ARM tablets will be charged $85 per device just for the operating system. You can’t do that and compete with the Kindle Fire on price. We will know more tomorrow afternoon. This could be big news, and explain a lot about Microsoft’s interest in the Nook line, or it could turn out to have no effect at all on Kindle customers. If not, it seems that there is nobody else on the verge of taking off until the anticipated Google Nexus tablet is finally finished. To be totally honest, a Kindle Fire vs Windows 8 tablet competition would be a much bigger thing to worry about. In case you were wondering where I was off to last week… I was on the BUILD conference watching Microsoft unveil Windows 8 developer preview. One of the first things I did is install Kindle App and I’m happy to report that it runs nicely on Windows 8. Microsoft did a great job ensuring backward compatibility. The screenshot was taken with the app I’ve just finished hacking together. So if you are into installing Window 8 to see what all of this is about, you can use this Window 8 Screenshot Share app to easily take screenshots and share them online with a few clicks (or taps of you finger if you have touch). Well… that didn’t take long. Only less than a month ago Kindle for Windows Mobile 7 was announced and as of today it is available for download. Currently, I don’t have a Windows Phone 7 phone handy and once I do I’ll be sure to write-up a comprehensive hands-on review. For now it seems that the app provides pretty standard reading experience for a smartphone eBook app. Although it is nothing extraordinary by itself, the Kindle for Windows Phone 7 expands the reach of Amazon eBook to yet another platform. What it means for end-users is that Kindle books are available on the widest selection of devices possible, despite using Amazon proprietary DRM system and completely ignoring ePub standard. If you happen to have WM7/WP7 phone and installed the application, please comment about your experience here. 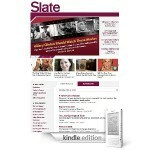 Slate magazine is offered daily on the Kindle and Kindle DX for $2.49 a month. Slate is a fully online magazine, and its revenues rely on advertising. I was surprised at the price of the Kindle version of this magazine considering that the web version is free. I’m assuming that the subscription fee is mostly in the Kindle formatting process. The issue comes out daily, so the price comes out to only 8 cents an issue. That is not a bad deal. 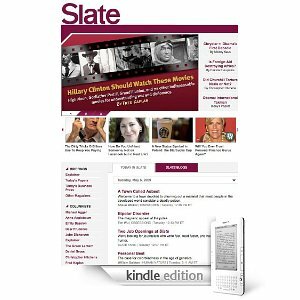 Slate was created as an online magazine in 1996 by Michael Kinsley under Microsoft, who later sold the magazine to the Washington Post in 2004. Slate covers the usual everyday news topics such as Technology, Politics, Life, Arts and Business. I love the lighthearted, informal style of writing that this magazine uses. This informal, first person style of writing was one of the pioneers of the writing style we associate with blogging today. The writing style seen in Slate matches the nature of the Kindle. The Kindle is designed to make reading appear fun, lighthearted and portable. Overall, the reviews for Slate are really good. The main complaints are that it comes out a little later in the day than the average newspaper at 9am, and the content includes articles from previous days. By 9am, most people are at work, so there goes the reading on the subway theory. Other than that, the reviewers said that it is really nice to have a summary of all of the major news papers such as the New York Times, Washington Post, LA Times and others all in one place. Another positive note about this magazine is that many of the articles are original and well researched, which says a lot about the quality of the content. 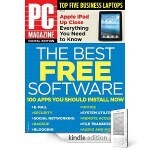 PC Magazine is delivered wirelessly on the Kindle monthly for $1.49. 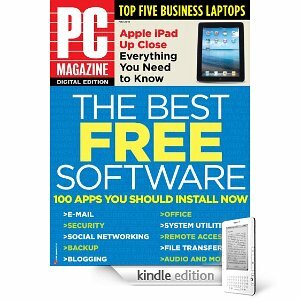 The Kindle edition is released the same day the magazine’s digital edition is released to subscribers. The last decade has brought evolution of existing technologies by improving them and making them much faster. The 2000’s have also seen the introduction of PDA’s and mobile devices such as cell phones, blackberrys, palm pilots and others. The e-book reader market is taking off with the Kindle, Nook and the iPad coming along. The tablet computer market not is too far behind. Over the years it has been PC Magazine’s job to cover the latest trends, analyze them and share the best results to the consumers so that they can make the most informed decisions in such a rapidly changing market. PC Magazine stopped selling print editions of its magazine so it makes sense to get it for Kindle if you want a portable device to read it on. However, based on the comments provided, it is highly recommended that the Kindle team add the images in for the articles. Many of the articles are based on the reviews of an item and it is helpful to have a picture of that particular item to refer to. Currently, PC Magazine is owned by Ziff Davis Publishing Holdings Inc and the stock information is private.